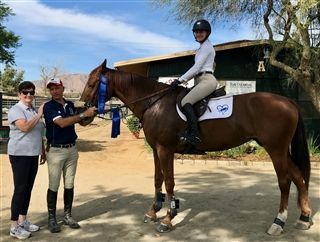 Sophomores Amelie Bittar and Georgia Botham earned top awards at the United States Hunter Jumper Association's Championships for Zones 9 and 10. 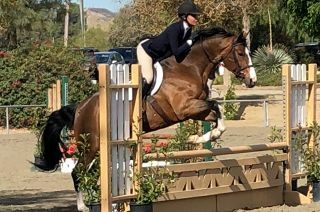 Based on their strong performances during the 2018 season, Bittar and Botham qualified for entry to the championships in the Junior 1.20 Meter Jumper division and the Children's and Adult Amateur Hunter division, respectively. Over the course of the weekend, Bittar and Botham competed in both team and individual events. Bittar ended the competition with an individual bronze medal, placing her third overall in her class, and Botham earned two silver medals and the title of reserve champion in both the team competition and the individual competition (pictured wearing her ribbons). 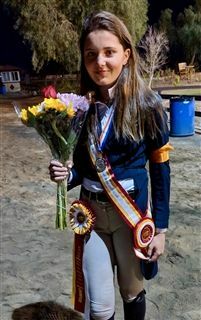 This continues the excellent record for both students, who competed in the first the Interscholastic Equestrian League tournament last month. There, Botham won first and second place ribbons in the junior varsity division (pictured jumping) and Bittar won first place ribbons in the varsity division (pictured on her horse). Junior Piper Anthony also competed in the IEL tournament, placing fourth out of 24 riders in the Freshmen Equitation Class and sixth in the Freshmen Jumper Class. Congratulations to these hard-working riders! Go Pandas! Go Heart!